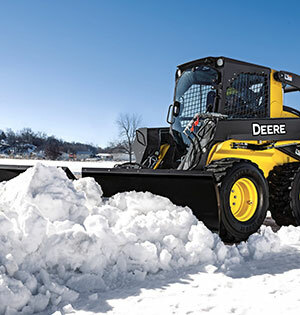 John Deere released its new Snow Utility V-Blades, the latest additions to the John Deere Worksite Pro attachment lineup. These attachments are designed for customers removing snow or performing light dirt work on the road, trail or job site. Delivering four hydraulic angling positions—straight for making larger cuts, V-configuration for pushing through hard-pack, scoop (both sides inward) for easy snow stacking and 30-degree right or left positioning for accurately moving snow or dirt—the John Deere Snow Utility V-Blades offer a variety of standard features to properly and efficiently tackle snow or light-dirt projects on the job site, the company said. The Snow Utility V-Blades feature an electrohydraulic valve for independent blade function that operators can control from the cab. A rubber cutting edge is also available for the blade to help prevent damage to decorative surfaces. Trip springs help protect the vehicle from sudden impacts with concealed obstacles and can be locked out for light grading and dirt work. The V-Blades are optimized to work with John Deere E-Series and 313/315 skid-steers, E-Series compact track loaders and K-series compact wheel loaders. The three new models—BV6, BV8 and BV9—are compatible with many competitive models.